If you use Banana Boat sunscreen you may want to read this story! 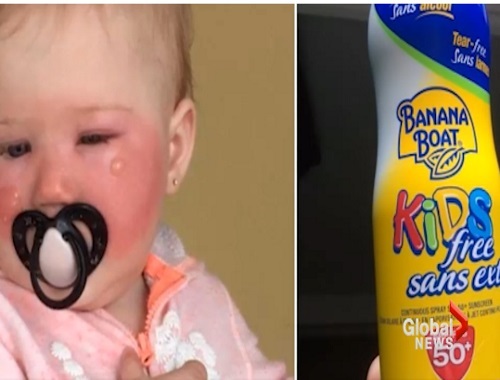 Health Canada says it’s investigating three cases of babies alleged to have suffered from severe burns after using Banana Boat sunscreen. So far, the federal agency says it’s received nine complaints of adverse reactions from the company’s sunblock. The three cases involving infants poured in over the past few weeks, according to Renelle Briand, a Health Canada spokesperson. A Quebec mom reported injuries to her 14-month-old on May 12, while another incident was reported to the federal agency’s adverse reactions database on May 15. “We are concerned when any person encounters a reaction using Banana Boat products. We take all of our consumers’ concerns seriously and investigate all cases when we are contacted,” a spokesperson said in an emailed statement. “Banana Boat sunscreens fall within a neutral pH range, which means they are safe for human skin, topical use, and cannot cause chemical burns, which are sometimes mistakenly linked to personal care products or confused with sunburns…For some people, their sensitivity to an ingredient can be triggered or exacerbated by the sun. Such a photoallergic reaction can result in an exaggerated skin rash or sunburn,” the statement said. The spokesperson urged Canadians to visit a dermatologist if skin issues crop up. They can also call the company line at 1-800-723-3786.